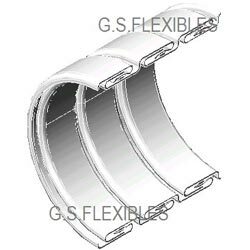 GSF exhaust hose is similar to Pressure Hose in principle. It is also fully interlocked and contains light duty packing. However the hose is optimized for performance in the specific applications. The Exhaust Hose is very flexible, has limited pressure tightness and is very economical. The hose is available in all the standard sizes. It is also available in wide range of weights to suit the severity of work conditions. GSF exhaust hose offers wide range of options for end-supports. Almost all kind of standard fittings can be very well adapted to suit the hose. GSF exhaust hose can be installed in most of the systems with minimal changes in existing sub-assembly. Fixed and floating flanges, pipe couplings and joints made of Carbon Steel or Stainless Steel can be attached to the hose. End-fittings can be attached by the means of ordinary arc welding, brazing or using epoxy adhesives. Exhaust Hose is supplied in Hot Dipped Galvanized Iron as a standard. It is also manufactured in Stainless Steel, on request. Standard Exhaust Hose GI-ES-XXXX is available in I.D. 1¼” through 10”. It exhibits excellent durability and good flexibility. For higher flexibility and less demanding applications light duty GI-EL-XXXX Exhaust Hose is an economical option. It is available in I.D. 1½” through 8”. Exhaust Hose is most commonly used in automobile exhaust assembly and generator exhaust. It is also used for conveying fluids under gravity and discharging industrial fumes and gases.